I have so much to write about I’m not even sure where to start! 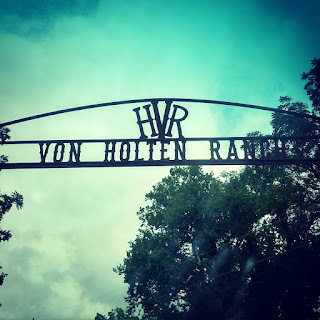 I suppose the logical place to start would be at the beginning – a few weeks ago, a friend sent me a message asking if I’d be interested in visiting Von Holten Ranch (VHR) with her during their event the Festival of the Horse. She had rented a cabin, and her boyfriend couldn’t attend, so she had a place for me to crash. All I would have to do would be pay to stall Ruby. VHR has been on my list of places to check out for a while now, so I jumped at the chance. The Festival of the Horse was going on most of the week, but due to hoarding my vacation time for some upcoming trips, I could only come out for the weekend. My initial plan was to work a half day Friday, run home, grab Ruby, and then double back (plus another hour+) to the ranch. It wasn’t ideal, but I had some work deadlines I didn’t think I could get out of. Luckily, some awesome coworkers produced their portions ahead of schedule, allowing me to work like a maniac on Thursday to get everything done, freeing up my Friday for a leisurely trip down to VHR. Mostly packed, the night before. 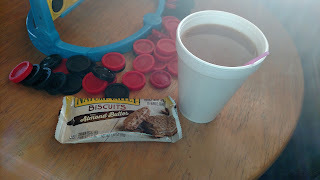 Friday morning I woke up with only a few goals in mind – finishing packing last minute odds and ends, do chores at my house, wash Ruby, and then hit the road. Of course when I woke up, it was raining…. womp womp. I hustled through chores at the house, tossed everything in the truck and trailer, and mercifully by that point, it had stopped raining. I popped down the road to wash Ruby, and she acted like she’d never been on the washrack or been bathed before. Super fun experience. 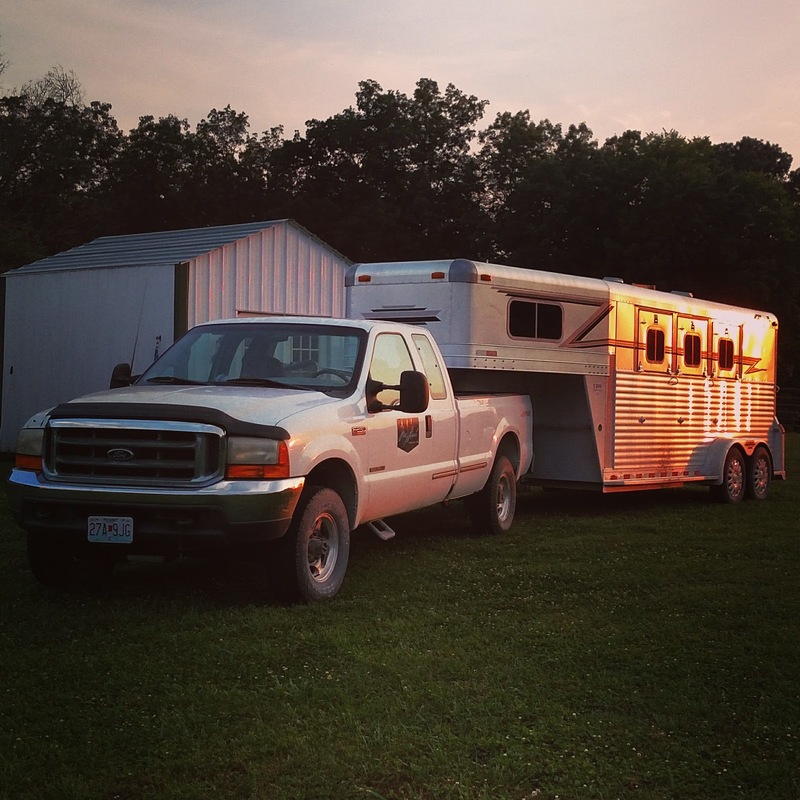 I was hoping that wasn’t an indicator of how the weekend would go…..
Kind of in love with my rig, not gonna lie. New clutch and all. She loaded up like a champ, and we hit the road! 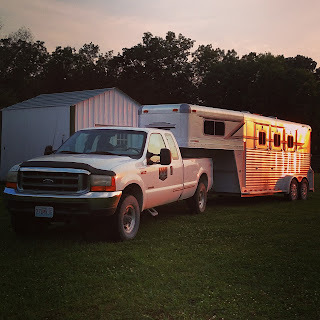 The drive down was more or less uneventful – my GPS took me a way that involved a lot of hilly, windy back roads, which was less than appreciated (if someone could make a GPS app for equestrians pulling horse trailers, SHUT UP AND TAKE MY MONEY), but by noon I was finally was pulling through the gates of VHR! 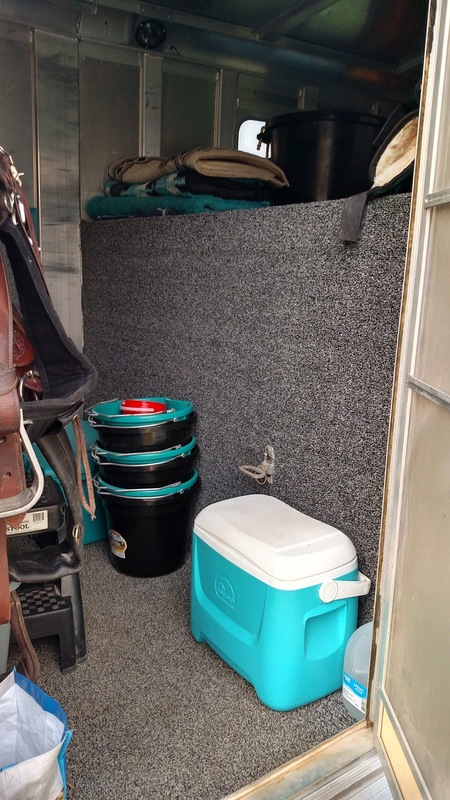 Ruby settling in to her 10x10 stall. Due to the MASSIVE AMOUNT OF STUFF I need to write about last weekend, I decided to break it up into (hopefully) manageable chunks. First I want to talk about the facility and the folks -- I have so much to say about my Hidez experience (I know ya'll are waiting for it lol), and all the wicked fun TRAIL RIDING we did. But I think the facility and the people earned their own special shout out before I even think about writing about anything else. VHR is a Century Farm, meaning it's been in the Von Holten family for more than 100 years (in this case, since 1906). Brandy and David are the 4th generation to operate it, and they're the geniuses behind the creation and maintenance of this little slice of horse heaven. View from the covered down towards some of the stalls. 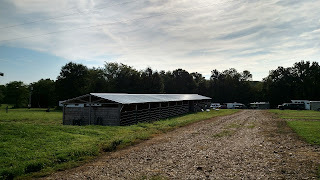 Another shot of one of the barns looking down towards the cabins. 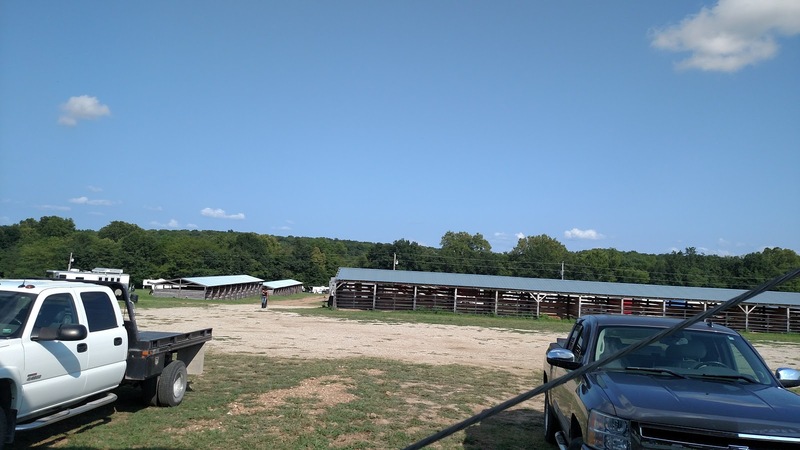 This 300 acre facility boasts miles of well marked and maintained trails of varying difficulty, a large (200x125) covered arena with excellent footing, a wedding/event barn (someone actually got married while we were there this weekend! ), 40 electric sites for camping, 4 cabins, close to 100 covered stalls, a heated/air conditioned shower house, and a plethora of obstacles and desensitization tools. 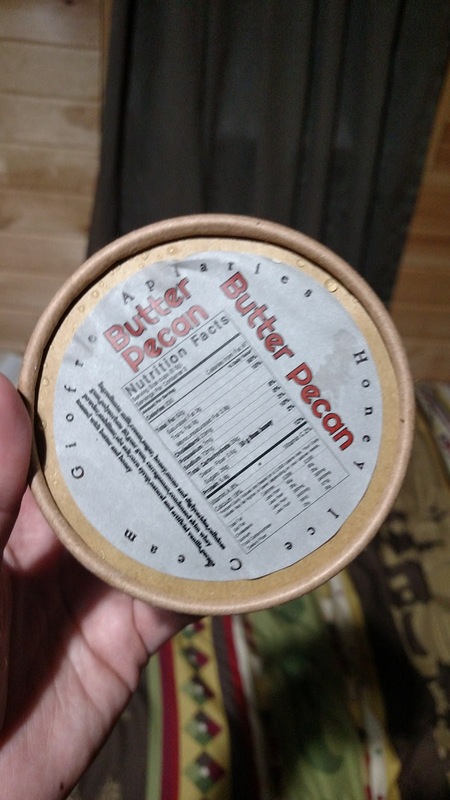 The ranch house also has a small selection of horse products and VHR merchandise (yes of course I bought things) and also features DELICIOUS honey ice cream for sale. 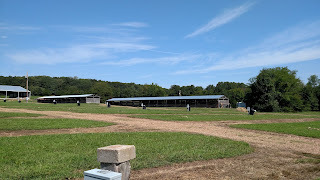 As a horse person, I appreciated all the care and thought that went in to planning these facilities. 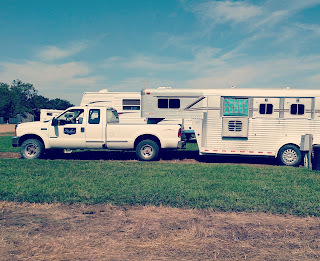 When I pulled in, there was a sign requesting I check in at the office, where they not only looked at my Coggins, but checked it against the horse in my trailer (in 10 years of traveling to shows and venues I don't think this has EVER happened to me before). 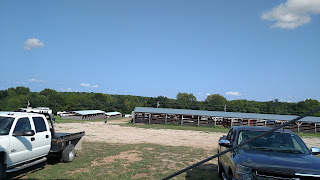 The barns had water hydrants, hoses and spray nozzles on each end, along with wheelbarrows and pitchforks for mucking (and a manure pile nearby). 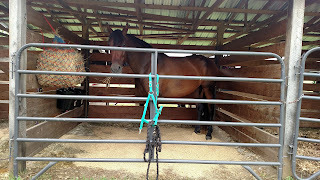 The stalls were breezy and easy for me to hang my buckets and hay net. 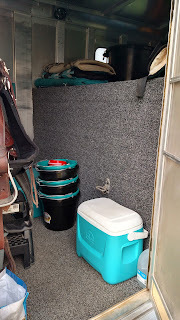 Although I brought my own shavings, VHR offers both shavings and hay for sale (or buckets and bucket straps, if you came super unprepared, lol). 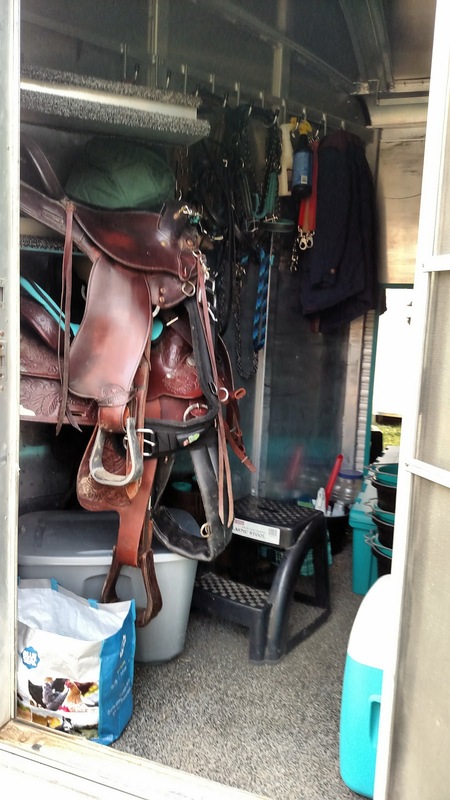 At the end of the trip, your stall needs to be stripped, or you can leave a tip in the office and they'll handle it for you. Many of the electric sites are pull through, which made navigating them in a horse trailer an absolute breeze (especially if you're rusty at backing a gooseneck horse trailer *cough cough*). 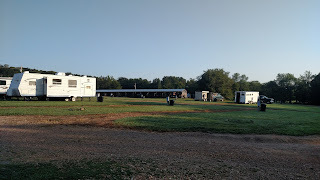 Each site has a gravel pad for trailer parking (we had beautiful weather but I imagine that's SO helpful when it's raining or muddy! 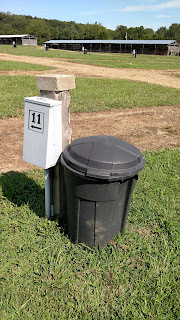 ), a fire pit, a trash can, and obviously an electric hookup. They were all well marked and laid out in a logical order. 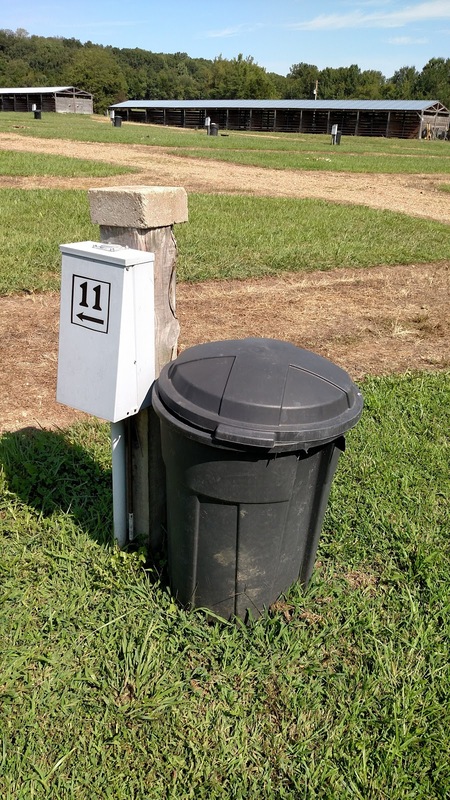 The trash cans were attached to the posts by horseshoes -- fun touch! 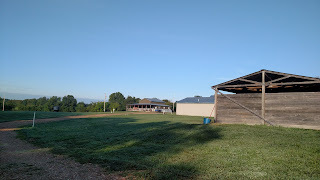 Ranch house in the far back, shower house in the middle, and stalls in the foreground. 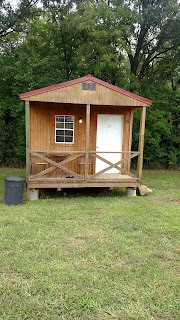 Our cabin was small but tidy, and offered two twin beds, a mini fridge, and a microwave. The little porch had a table and two chairs. I brought sandwich stuff, chips, and hot dogs, and combined with the ice cream, did just fine on the food front. Depending on the events each weekend, sometimes VHR offers food for purchase -- Saturday we had tacos! They also have complimentary coffee in the ranch house in the mornings, so you can bet where I was every morning, lol. Although the main draw for me was the trails, I also had a chance to utilize some of their very cool trail obstacles. Some of the bigger ones are set up outside the arena, and one whole corner of the arena holds an eclectic mix of objects you can set up and practice with to your hearts content -- I think the most hysterical one for me was the taxidermied racoon. The double take Ruby did when she figured out what it was had me laughing so hard I almost fell off. 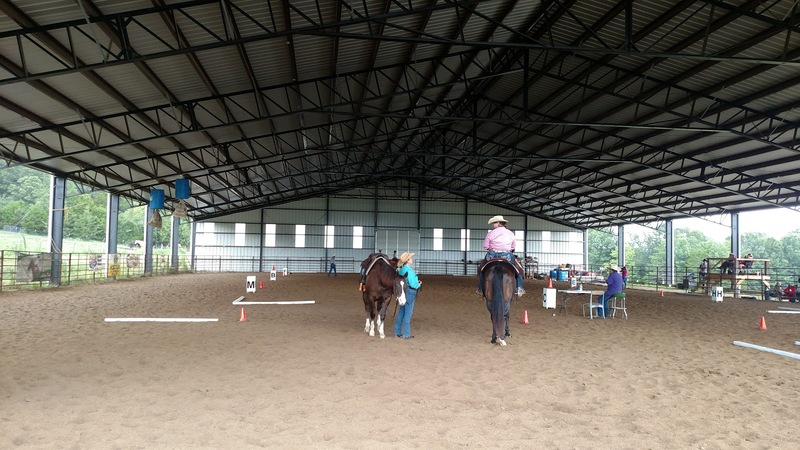 I didn't spend much time in the arena, but we did enjoy the pedestal and teeter totter to my heart's content. 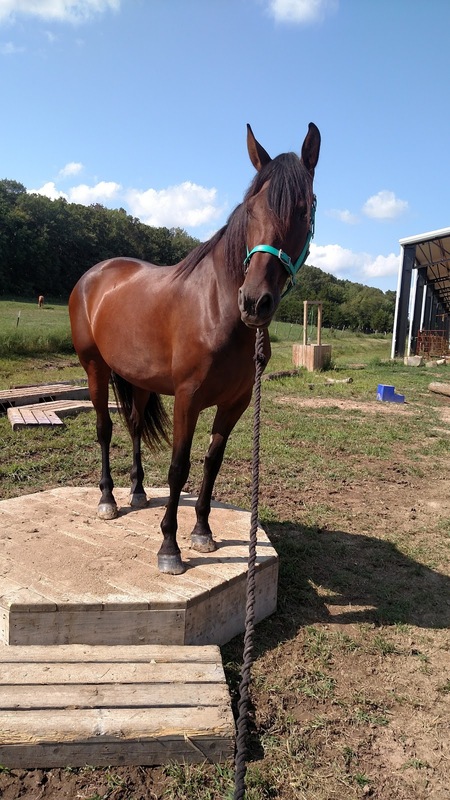 I was curious how Ruby would react to them, but after some initial side-eye, she climbed on everything like she'd been doing it her entire life (although her comical scramble off the teeter totter the first time it moved was almost as hysterical as the racoon thing). Standing on the pedestal less than 3 minutes after sniffing it for the first time. Bored with the teeter totter (until it moved, lol). Although the trails merit their own separate post, the last thing I need to praise about VHR has to be the people. Brandy and David are some of the nicest, hardest-working, innovative people you will ever meet. I don't think I ever went more than 2 hours without seeing one of them zipping around on a mule (the motorized kind, although Brandy does also have an ADORABLE mule named JoJo that she competed last weekend) helping someone out, delivering shavings or firewood, problem solving, and generally just making sure everyone had a great experience. They were the first people up in the morning and the last ones to crash at night (I have no idea how they can function on that little sleep, because I sure couldn't!). Any hint of a problem, and they were there to help you try and solve it. They were never too busy to stop and answer questions, and always gave you their full attention when you needed it. Customer service can make or break an experience for me -- and in this case, 15/10 would absolutely and wholeheartedly recommend VHR and Brandy and David. 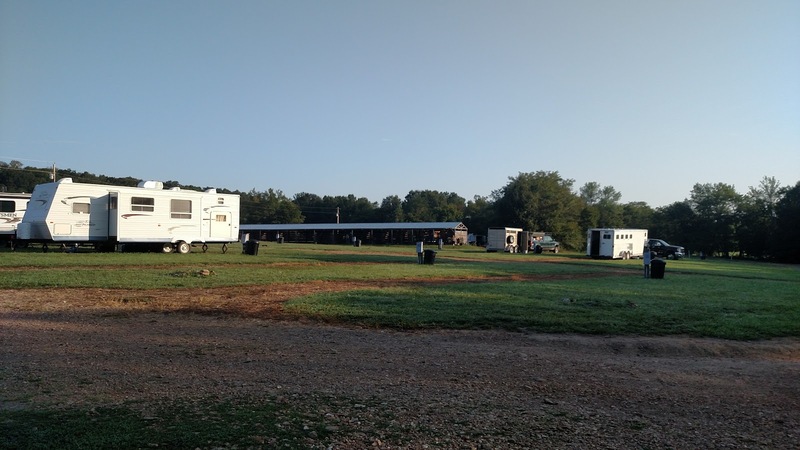 I wanted to scope out the ranch as a possible weekend trail ride getaway for me and DH, and I cannot WAIT to go back. If you haven't visited yet, you're missing out! Check out their calendar of upcoming events, and get down there! Sounds like so much fun! Yay for you two! It was definitely a great time! This place sounds amazing! Was it organized events, or just kind do what you want? I'm sure you'll cover that later, but I'm not patient! Haha! 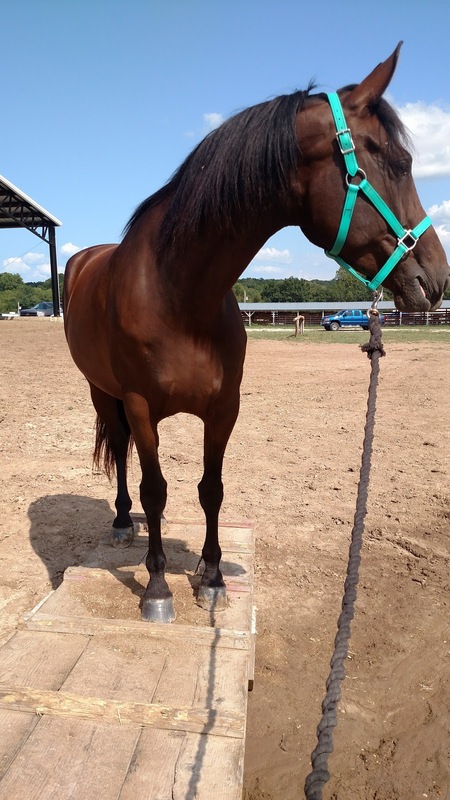 Also, there is a GPS (probably many, but I don't know how to make that plural) for tractor trailer drivers that would also work well for us horse gals. It knows where you can and can't take a trailer, and also the easiest routes to take with one. I keep saying I'm going to invest in one, but haven't gotten around to it yet. 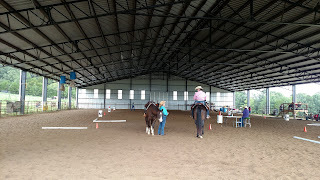 There were organized events (in this case, western and gaited dressage, and possibly some I missed? ), but you could also do your own thing (which was what I did). Oooh that sounds perfect. I wonder how much it costs? I never really went that far researching them, but I think they run about the same as a regular one. 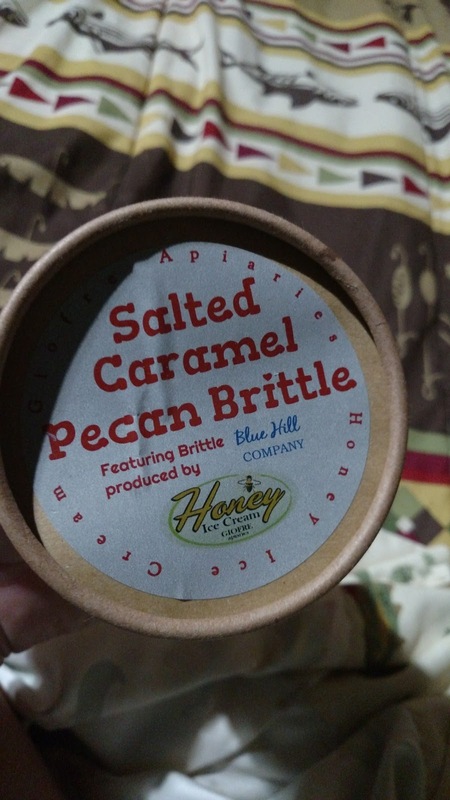 Honey ice cream? An absurd raccoon? AND a good horse? Sign me up. Definitely a trifecta of awesome 😉 I never wanted to come home! Sounds like such a cool place! Hospitality really makes or breaks an event! What a beautiful setup. Absolutely -- and Brandy and David are some of the best! Their place is so lovely. It was amazing, I want to run away and live there forever! TEENY CABIN FOR THE TEENY LEAH!!!! B is obsessed with that ice cream to the point where it's becoming an issue. Also, so happy that Ruby was such a champ all weekend!!! Love the facilities and especially the cabins and covered arena. It's awesome they ACTUALLY check Coggins. I wish more people did that. It was so fantastic! And yes, I was incredibly appreciative that they actually checked the Coggins. 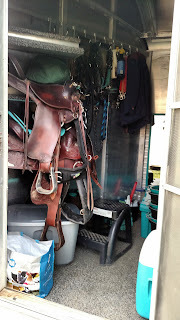 One of the owners actually got in my trailer to make sure my horse matched my paperwork. I thanked them both profusely haha they probably thought I was nuts! This place looks SO FUN!!!!!!!!!!!! I bet you could find something similar! Sounds like a really cool venue. 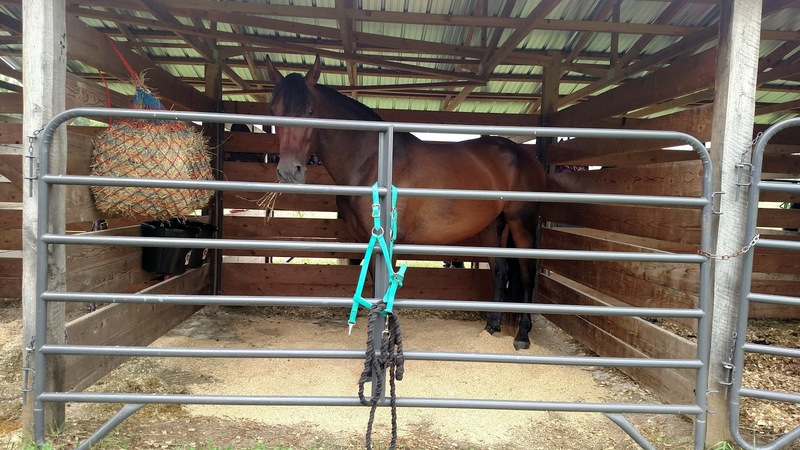 I wish horse places I went to had cabins to rent. That was the best part! 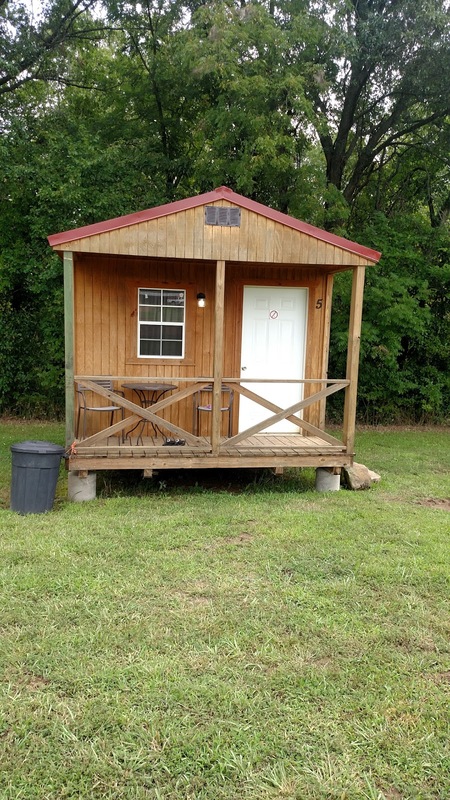 I mean, ideally I would love cabins that had a bathroom in them instead of having to walk to one lol, but I understand for heating logistics, what they did makes way more sense. I just had to remember to make a late night trip to the bathroom before I went to bed and hope I didn't have to go in the middle of the night/ But the cabins were so cute and cozy. And surprisingly affordable! This is awesome! Glad you had a great time. 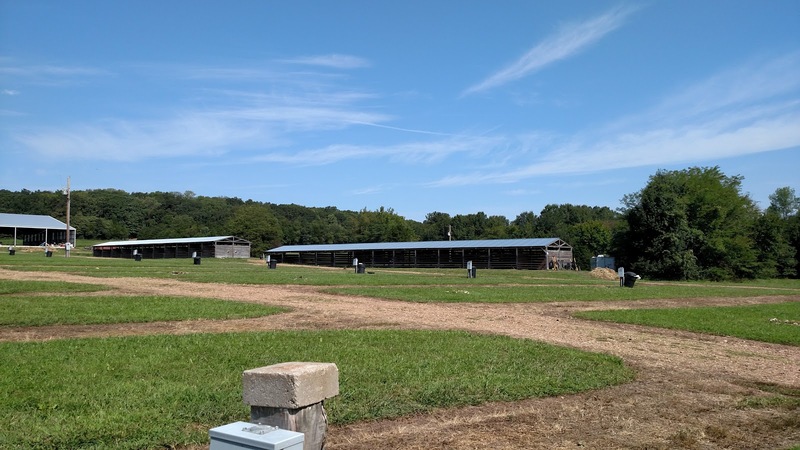 Loving the idea of a Century Farm, and also the honey ice cream. It was so fabulous! And yes, the ice cream was delish!